Marantochori is a traditional village of Lefkada and is found roughly 30 km. from the capital city and 5 km. from the famous village of Vassiliki. The village is an ideal place to relax and have some rest time. In addition in the beautiful and clean beach of Ammouso, there is a traditional restaurant, ­taverna, where everyone can eat fresh fish or traditional dishes. In the area of Marantochori there is a small natural lake which is an important wetland because of the many species of flora and fauna. For your evening entertainment you can visit other seaside traditional villages of Vassiliki, Nidri or Sivota with lots of restaurants and clubs. Vasiliki it is one of the most popular, touristic destinations in the island and is 40 km. SW from the town of Lefkada. Vasiliki is famous for windsurfing. At least three companies offer rentals and lessons for you to try your hand at windsurfing, with three sessions a day. Winds vary throughout the day, accommodating many levels of wind surfers. The waters can become quite crowded with surfers during the afternoon. Transportation: By car: Lefkada is the only island which can be visited by car without ferry boats fares by using the floating bridge connecting the island with Akarnania. By plane: From Athens are performing daily flights from the international airport of Aktion (18km. 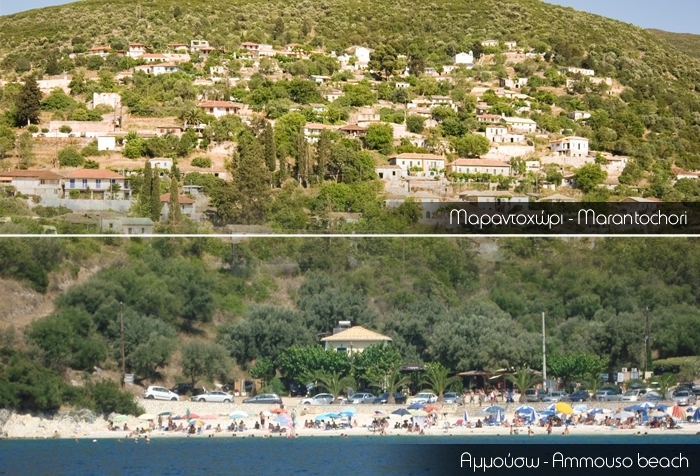 from the town of Lefkada) and from Thessaloniki 2 flights weekly. Corfu, Kefalonia and Zakynthos (Zante) are connecting stations. From April until October, direct flightsare performed from Aktion and Europe.